The doctors of Clínica Tepati allow us to open the clinic to our patients each Saturday. 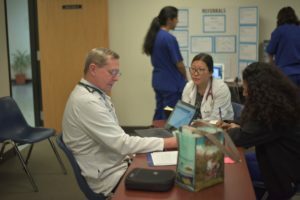 Thankfully, through the continuous support and help of our current preceptors, we have been able to remain open every Saturday for several years, without skipping a single Saturday. Our preceptors have the humbling experience of working with underserved patients each Saturday. Furthermore, many preceptors find Clínica to be a great opportunity to motivate medical students and undergraduates to pursue medicine. Physicians are very involved with Clínica. They listen to medical students present their cases and guide them through the diagnosing process. They also assist the medical students in examinations and unfamiliar procedures. The Medical Director attends clinic at least once per month to make sure we have a preceptor every Saturday, and review patient charts to assure quality care. If you are interested in becoming a preceptor at Clínica Tepati or just want to learn more about the experience, please contact either our Preceptor Coordinator, Michelle Guerra at maguerra@ucdavis.edu, or our Executive Administrator, Jasmin Santos at jgsantos@ucdavis.edu.